Discussion in 'The Shop' started by kajo, Aug 28, 2005. 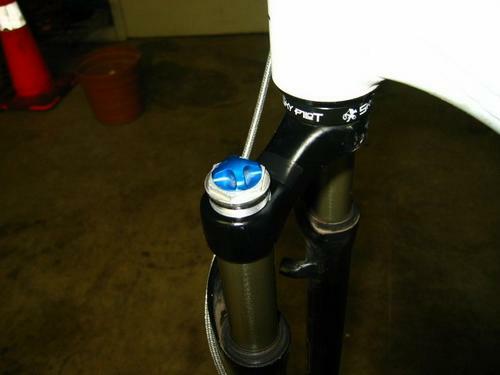 I've got a Fox F100RLT 2004 fork and it's leaking from the top cap. The cap has never been removed from the fork before so why can it be leacking from there. I have attached a pic of the area where the oil is coming from. Looks like there are some unevenness where I have marked with a red ring. What can I do? Do I need a new cap or do I need to send it in? I thought there was supposed to be an o-ring there. The o-ring was there. I just took it off when I took the picture so you can see better. The o-ring looked good so it must be the marked place in the picture. I would guess the marks are from a loose cap being ridden on. Get a new "O"ring from a hardware store. Super cheap part. If it works great, if not your out pennies but you gained some knowledge. Looks like the whole top cap has been mangled by a set of channel locks. If a new o-ring does not work get a new top cap and the correct socket to install it. the part below the blue knob looks a bit... mangled. could thank have anything to do with it?